November 1, 2018: Triangle Family Dental Spa would like to share an event — we’re feeling inspired by Berkshire Hills Music Academy. Triangle Family Dental Spa is proud to sponsor this concert featuring Sullivan Fortner and Roberta Gambarini at the Berkshire Hills Music Academy. We support their mission: BHMA uses music to help individuals with intellectual disabilities develop skills for communication, independence, and employment. WHY: Benefit concert to support BHMA in their mission of teaching individuals with intellectual disabilities develop skills for communication, independence, and employment. Tickets are $20 in advance, $25 at the door, and $15 for students. Purchase yours here: berkshirehills.org/jazz. September 28, 2018: It’s HERE!!! Fall leaves + cooler temperatures = OCTOBER GIVE-A-WAY time!! We meet together as a team every 2-3 months and drum up ideas on how to better treat, care for, and give back to our patients. For the entire month of October, if you refer a friend or family member to Triangle Family Dental Spa and they give you credit for finding us, you’ll get a TICKET entered into our October lottery! 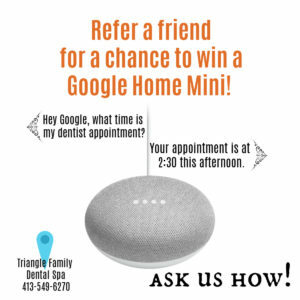 As a prize winner, you’ll receive an awesome GOOGLE HOME MINI! We all own one and feel that you should too! August 30, 2018: A warm welcome back to Amherst, Massachusetts for all of our local college students! Are you looking for a dentist near UMASS, Amherst College or Hampshire College? Many college students get busy with academics and forget to schedule a dental appointment. 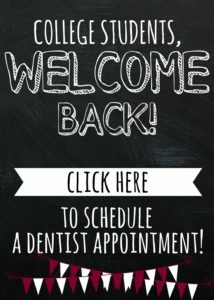 No matter how long it’s been since your last cleaning, or if this is your first dental appointment, feel free to call us! We’re excited to have you here! As your local dentist, our goal is to keep you free of oral/dental emergencies and problems. Preventative care is key — avoid long-term issues by scheduling your cleaning, exam, and x-rays today! ✓ We are located approximately 1-minute drive / 5-minute walk from Umass! ✓ If you plan to drive in, we have free parking! ✓ Riding a bus? We are an easy transit! Click for PVTA bus route. ✓ Schedule your dental cleaning today by calling 413-549-6270. Frequent cleanings at the dental office with dental equipment is needed to remove calculus (tartar) and plaque build-up. October 31, 2017: Halloween is best known by kids as a day to collect (and consume!) as much candy as physically possible while dressing up in a costume! You know the song, “I want candy!” ? Here are some ways you might not have thought of to keep the day a little healthier and safer for your teeth! ✓Fill the kids up with a big healthy meal prior to trick-or-treating so that the candy doesn’t become their meal. ✓ Prior to collecting, set a limit on the amount of candy they can eat at the end of the night. ✓Err on the side of caution and check for tampered with candy prior to letting the kiddos eat it. 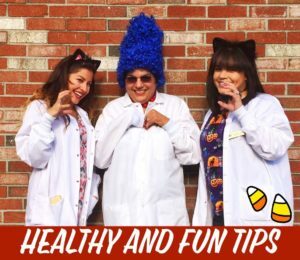 ✓Find fun ways to “earn” the candy throughout the week based on healthy eating. ✓Limit the amount of time that sugar is in contact with your child’s teeth. 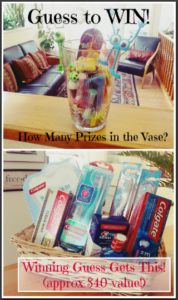 Remember to brush, floss and rinse as soon as you finish eating the candy. ✓Use fluoride to help prevent cavities. ✓Schedule your dental cleaning. Frequent cleanings at the dental office with dental equipment is needed to remove calculus (tartar) and plaque build-up. New patients always welcome here at our family owned, private practice. ☎ 413-549-6270. August 24, 2017: Life is busy, isn’t it? When was the last time you were able to sit back for 45 minutes and relax while checking something off your task list? There’s always somewhere to go, something to do, or something to achieve. All the scientific proof that relaxation is good for you doesn’t stop the fact that your “to-do” list needs to be…… and life happens. That’s where we come in. You have to get your teeth cleaned. We know that. Tarter builds up and leaves your teeth looking lifeless and under the attack of the almighty cavity. ? Ew. Since you’re here anyway, why not take the pause in life you need and deserve while crossing something off your bucket list — ✅ a dental cleaning. 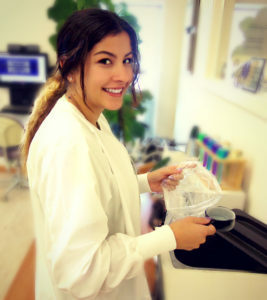 We snapped a picture of Shannon preparing a relaxing paraffin hand wax for a patient prior to their dental appointment. This warm, thermo-therapeutic hand treatment is both relaxing and moisturizing. Infused with essential oils, this complimentary treatment will make you feel like you’re at the spa, not the dentist. ? Our goal is to treat you the best. 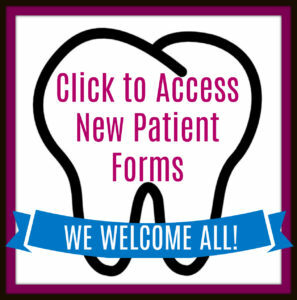 We know you’re busy and care about your teeth and we care about YOU! Let us spoil you at your next visit — say “yes” to the paraffin hand mask! Available to both check-up and cleaning appointments as well as patients here for cosmetic or restorative purposes. New patients always welcome here at our family owned, private practice. ☎ 413-549-6270. May 24, 2017: Your donations of gently used clothes helped support 100+ families in the Franklin County area receive free clothing. Together we make a difference. Thank you! August 19, 2016: It was Give-A-Way Time!! Thanksgiving in 2015 thank you for your support with food donations to the Amherst Survival Center.